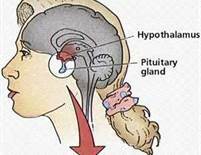 Is Pituitary Dysfunction Behind Your Thyroid/Adrenal Issues? A great deal of the thyroid hypofunction that occurs, according to studies tracking blood chemistries, have their locus in the anterior pituitary or adrenal glands. Many times patients display symptoms of cold hands and feet and obesity among other symptoms. Upon testing, their thyroid panel is perfectly normal. If anything, the sTSH is low rather than high. High is where you would expect to find it, above 3.0, if the patient was a true hypothyroid. However, we find sTSH values down below 2.0, and that tells us that the pituitary and the thyroid simply are not communicating and in some cases the hypofunction at the pituitary level is also causing either adrenal hypofunction or hyperfunction. This is more common that you think and can also cause digestive issues since the pituitary plays a role there as well. When adrenal dysfunction occurs, we have to fix the real problem, which is frequently at the anterior pituitary level. Using Cytozyme-PT/HPT together with ADHS will, in most cases, will improve things, especially if the diet is fixed to remove refined carbohydrates and foods high in complex carbohydrates. In addition to all of the uses for Cytozyme-PT/HPT, we also consider it with insomnia, epilepsy, anorexia, inability to gain or lose weight, carbohydrate sensitivity, and neuromuscular disorders. We can tell you another place where we’ve seen excellent results with Cytozyme-PT/HPT: Any female whose migraines occur on or near her menstrual cycle or exacerbate on or near her menstrual cycle is a candidate for pituitary therapy. That information is from Practical Endocrinology by Dr. Henry Harrower and it is as true today as it was over fifty years ago when Dr. Harrower recorded it. Cytozyme PT/HPT has the highest concentration of pineal of any of the Biotics Research products. If you are looking for a pineal supplement, this is the one. Since we are talking about pineal, can we talk for a moment about melatonin and its use for jet lag? It may be very effective for this problem; however, it can cause hangover like symptoms for some people and melatonin included, we still have not found anything that works as well as thymus (Cytozyme-THY) for jet lag. Start taking it two days before you go on a trip at two tablets, three times a day. Take four tablets just before they get on the plane and a couple of tablets every hour while they are on the plane. The other nice thing about thymus is that you take literally hundreds of tablets of Cytozyme-THY and you are not going to cause any harm. Back to Cytozyme-PT/HPT: for migraine headaches associated with menses, use the product at two tablets TID and we need to rule out a carbohydrate handling problem. In the majority of cases, carbohydrate sensitivity and/or reactive hypoglycemia are present. Therefore, Bio-Glycozyme Forte or GlucoBalance are generally also indicated along with dietary changes to eliminate refined carbohydrates and decrease total daily carbohydrate intake (if you are overweight). If there is no response with this therapy, a copper body burden should be ruled out and we can do this with a hair analysis. Wilson’s disease is a problem involving toxic levels of copper but beyond this problem, increased copper levels can cause psychological and other problems. Several studies, including the work completed at Chino Prison in California, have implicated copper body burden as a cause factor in hyperactivity, learning disability, and psychological problems. One more thing to be aware of with copper: if you have been on, or are currently on exogenous estrogen (birth control pills), and are having a problem with weight gain, inability to lose weight, headaches, and transient joint pain, always rule out a copper body burden. Cytozyme-PT/HPT, a source of ovine pituitary and hypothalamus from young lambs, is one of the premiere neonatal glandular products produced by Biotics Research. Another excellent product from Priority One is Pituitary +. Both have pituitary, hypothalamus and pineal.